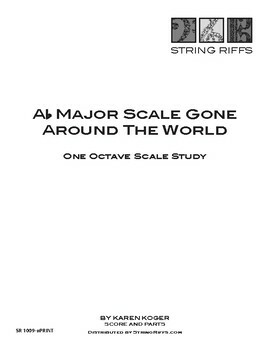 String Riffs Ab Major Scale Gone Around the World is a One Octave Scale Study useful to orchestras (vln, vla, clo, bss), individuals or studios. 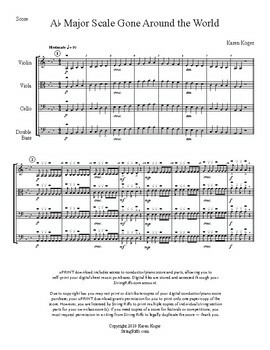 Introduce the Ab Major Scale, Sight Read, or use Ab Major Scale Gone Around the World as your daily warm-up. Each String Riffs One Octave Scale Study explores rhythm, style, bowing, and the basic scale. Each scale is different to encourage music reading and counting. Also available individually C Major thru 4 sharps and 4 flats, or you may choose to select all 9 scale studies in one download.